Editor Note- I would like to introduce MotoIQ's latest columnist Billy Johnson. You have probably heard of him as one of the top Time Attack Pilots in the country. Outside of the Import Performance world, Billy is also a Top Professional racer competing in the Grand-Am Sport Car Series for Horsepower Ranch/Roush Racing's Ford Mustang GT with a winning track history. Billy is also a Skip Barber instructor. It is an honor to have someone of his caliber gracing our pages. Follow Billy in upcoming months as he shows us the fast way around many of our countries fastest track and gives us advanced tips on driving and racecraft. You know I will. 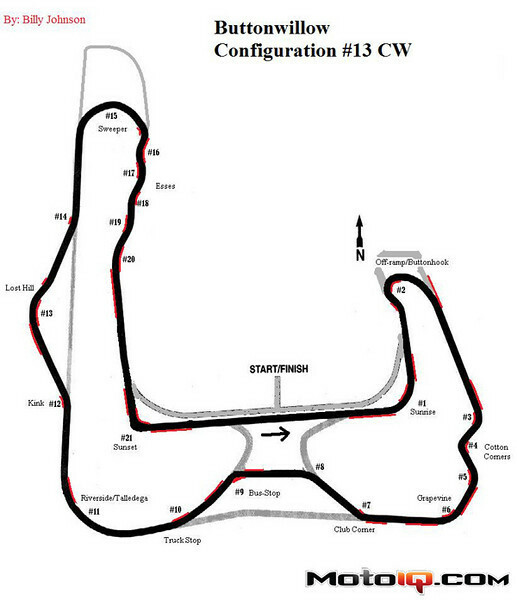 Buttonwillow (BW) is a great test track used by many professional sports car and formula car racing teams because of the track’s variety of corners. From on-camber and off-camber corners, to sweepers, chicanes, hairpins, and man-made elevation changes, BW is a well-balanced and technical track that challenges both the driver and car. In recent years BW has become center for Time Attack drivers and teams attracting cars from as far away as Japan. It has also become the benchmark for bragging rights for many OEM manufacturers. While on the front straight approaching the first turn (Sunrise), use the access road and the red & white curbing on the right as a reference point to gauge where to brake. Finding a brake reference point is important for consistent entry speeds and learning. Once the majority of the braking is done and the downshifts completed, trail off the brakes as you approach the apex. Since the corner has a fairly large radius with no long straight after it, entry speed is good. Carry as much entry speed as possible, get down to a slightly later apex, then pick up the throttle half way through the corner and squeeze to full throttle tracking out of the corner. Turn in a bit late for the left kink once you can see daylight between the apex of the left kink and right hairpin, aiming at the apex of the right-hand hairpin. It is important to get the car slowed down here and not overshoot the corner because the exit is far more important than the entry. A lot of time can be found by getting a good exit which is difficult due to the elevation changes in the corner. The apex is on-camber/banked but the road falls away the further you track out. In lower power cars, you want to turn into the right hand hairpin from the middle of the road, and let the car track out and run the ‘outside line’ onto the straight. The more grip and less power the car has, the bigger the radius you can make the corner and still put the power down. For higher power cars, I’ve noticed keeping a tighter line is faster. Once the car crests the little hill ¾ the way though the corner, the car will be straighter sooner (than the outside line), and power can be aggressively applied for a good exit. Since Cotton Corners is a series of corners with no straightaway after it, a lot of entry speed can be carried into it. Use the curbing on the left as a braking reference point and trail the brakes down to the apex. Make sure to get off the brakes and transfer the weight off the front of the car as you coast over the entire right hand curb. You don’t want to upset the car with the front heavily loaded when hitting curbs. Emphasize a late apex for the series of corners. Place the car in the middle of the track, setting up for the next left hander. A brief throttle application then tap of the brakes to set the nose will help keep the speeds up between the two corners. You should carry enough speed into the left hander to be able to coast through the majority of it off throttle. Like the preceding corner, be in the middle of the track to set up for turn 5 (the crest of the hill). Depending on the car, I sometimes use the curb at the crest. Using the curb can often upset the car and cause it to hop, a well setup car and a good line will reduce this problem. Make sure to late apex this blind corner since the exit tends to come up quick. 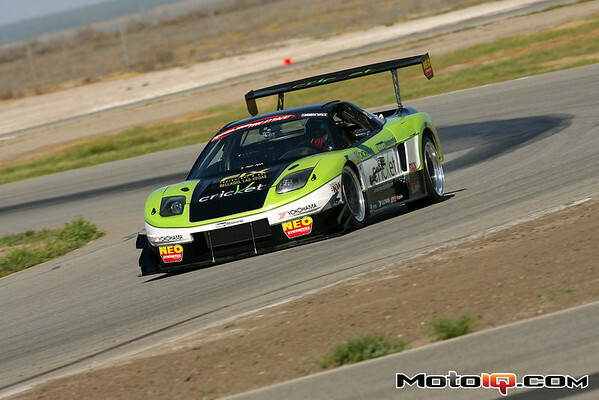 The FX Motorsport Development NSX that Billy takes us for a ride in around Buttonwillow in the video. Billy holds the Buttonwillow Redline Time Attack overall record at 1:45.5 in this car.